After my grandmother passed away last year, this petite chest of drawers was the only piece of furniture I took from her house (my mom, aunts, and cousins, of course, divvied up the rest). It had sat in her entryway for as long as I can remember, and of everything she had, it somehow symbolized her home -- where I'd always felt loved and welcomed -- the most for me. The little dresser dates from 1939, not long after my grandma and my long-deceased grandfather were married, and it followed her through their many turbulent years together and their many cross-country moves -- from Chicago to New Jersey to Boston to Pittsburgh, back to Chicago, then to sunny post-war Los Angeles, and finally, to the Bay Area. It's not a particularly fine piece, but it's solid and useful, has a bit of 1930s-'40s flair with its chunky Asian-style brass pulls, and just reminds me of my grandmother in a fond way. 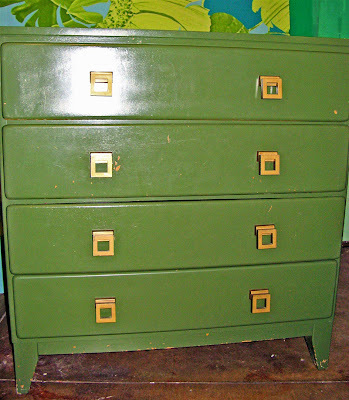 Its olive-green paint job had seen better days, though, and I wanted to update the chest with a splashy new color. I totally could have stripped, sanded, and repainted the thing myself, but I knew it would take me five years to get around to it and, truth be told, I'm just not all that meticulous about these sorts of projects. This is a special piece for me, and I didn't want to mess it up. So when I heard that Johnelle Mancha, the proprietress of Old Oakland's Mignonne, was offering a new furniture-refinishing service, I was all over it. After consulting with me about the look I was after, Johnelle carefully stripped and refinished the dresser in a happy, glossy apple green that's a nod to the original hue but that gives the piece a more modern and surprising feel. (We literally matched the paint to a Granny Smith apple I'd brought from home.) I couldn't be more pleased with the results. The cheerful chest now sits in my own entryway, where I've topped it was some of my favorite little treasures (like a vintage globe and wooden spool from eBay, a porcelain skeleton key from the Curiosity Shoppe, a ceramic-and-wooden apple from Relish at Home, and an Aida Dirse candy bowl from Rare Device), and where it reminds me of my beloved and dearly missed grandma every time I pass by. 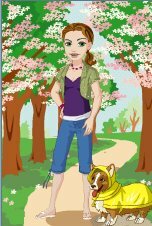 Thanks so much, Johnelle! It's so pretty. Simple, clean, cheerful color. Did you also paint the drawer pulls to be a darker color? No, the pulls are still the same aged brass -- though I'm thinking about spray-painting them black, just for extra contrast and drama. I love the pulls as is...just my 2 cents. What a VERY cool chest! The hardware is fantastic, and I love all of your things. It is so nice to keep the history alive....something to pass on to your kids. You are giving me ideas! Very, very cool. I, too, like the pulls as they are. It's funny how changing the color of the chest can fool your eye into thinking that the pulls were changed, too! I love your color choice--an updated version of the original! It looks awesome! The color is perfect. Super gorgeous, love the pulls and your color choice! What a wonderful keepsake. I just read your original post on her passing. I'm so sorry for your loss, but I'm glad you have a fabulous reminder of her. I still have a photographic tour of my grandparents' SF house in my brain, and I "visit" it every once in a while. It's comforting to think of the things that lived with the people. Great result - and it's extra nice to be reminded of a person that meant something to you! It gives the object so much more value. I too have a special chest of drawers that I received from my grandmother. It is in a shade of green that she painted at some point and happens to be a green that I love. I changed the drawer pulls and think of her whenever I walk past.